I bumped into Jonathan Porterfield the other day, AKA poster boy for Eco cars in Orkney. We hadn’t seen each other for quite a while and had a good catch up, and as I turned to leave I saw Jonathan’s car. 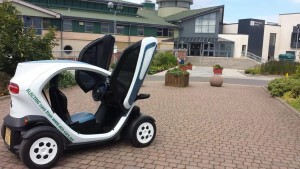 ‘It’s a Twizy’ replied Jonathan and he invited me to come and have a look. 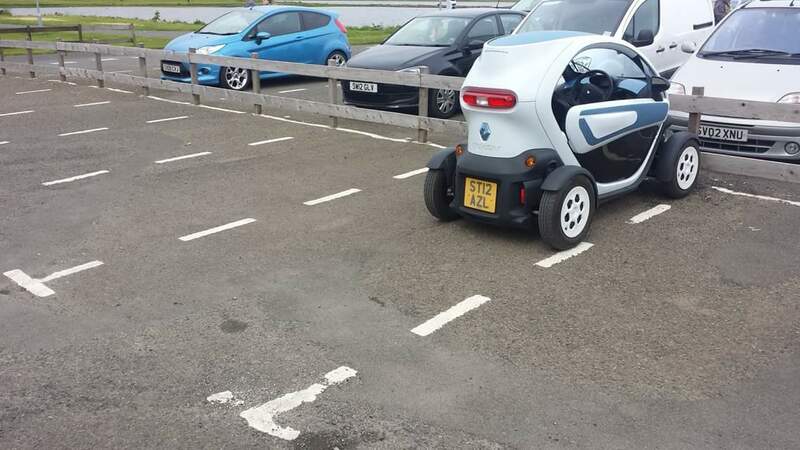 I think it must be the smallest car I’ve ever seen; let’s just say if Noddy drove an EV this would be it. It was pretty comical to imagine Jonathan even getting in it. He’s about 8ft something, I’m not exaggerating here, in fact that’s probably the distance between his ankles and knees. So how in the heck did he contort himself to get into it? I think there’s video footage somewhere which he will probably add to the blog. I climbed in, (not sure if there’s a hugely dignified way) and looked for the slot where I put my money and wait for the music to start, but Jonathan handed me a key. A KEY! Like for an actual car! ‘I can’t start the car, I’m turning the key but nothing’s happening’ I shouted out the window. It was an easy mistake to make. I’m amazed it even had a glove compartment but then I realised why and we’ll come to that later. After a second attempt I got the car started and then turned it around to head down the road. No three point turn needed for this little bad boy, you could probably just actually turn it around in the parking space. I headed down listening for the roar of the engine or rather the sound that reminded me of the milk floats that used to deliver our daily pint as a child. I’m quite short, so was comfortable enough, but I’m not sure how Mr 8 footer over there manages without feeling like his chin is on his knees. So after a few minutes burning up the roads (23mph) I turned round and headed back chuckling all the way. My parking space had gone when I returned but no worries, I could just slot it between two cars parked side by side. It’s THAT compact and bijou darlings. That’s one of the benefits; parking would never be a problem. You could fit it into the smallest of spaces and in fact you could almost pop it in your hand bag and carry it around with you. It’s a great way of getting from A to B provided you’re not in an enormous hurry, but Jonathan assures me he’s got it up to 50mph, (I suspect downhill with a tail wind) There is also room for a passenger, provided you quite like each other and don’t mind driving with someone else’s legs either side of you. It’s a very low cost vehicle at £3000 but you do still need a driving license to use one. Twizy with ‘lambo’ doors ! It’s pretty robust in the wind but due to the plastic, zip up windows with gaps it perhaps wouldn’t be a first choice for keeping your hair intact on a wild and wet day. There’s no radio or heater so maybe that’s why there’s lockable glove compartment. You’re really going to need those gloves and wouldn’t want anyone stealing them or for them to blow out of the window as you rush by. All in all, it’s great for the fun factor and would be very useful for popping out and about to appointments. I’m perhaps not ready to own one but I can tick it off my bucket list has having test driven one, and to be honest I didn’t even know it was even on the bucket list.